Throne of Blood begins with a Preamble. The Preamble sets the tone for the book, just like the Preamble to the United States Constitution is a brief introductory statement of the Constitution’s fundamental purposes and guiding principles. 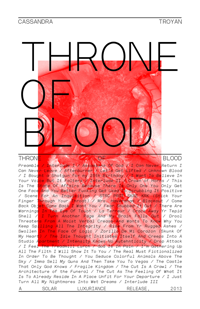 Presumably, the poem would provide some of those for this book, Throne of Blood. The Preamble begins with lyrical horror. The narrator is unbothered by dead women crowding the drained lake and the house, even when their bodies are used for decoration or masturbation by the male character. The narrator’s point of view changes when it becomes clear that the male character is the one making women into corpses. The excellent David Peak and Mike Kitchell have new books from SOLAR LUXURIANCE, in an edition of 30 and 10. Grab one up before they’re gone. Here’s half a descriptor for Mike’s piece: One morning I woke up to find my browser open to an archive of an online Deleuze & Guattari mailing list. Scrolling through it I was struck by a narrative text by a user who went by the name of “rongrong.” Nobody at any other point in the archive made any reference to rongrong’s enigmatic post. I thought it was amazing, a hybrid theory/text that was interesting, distant, and intelligent. I decided, as an homage to the hidden mysteries of the web, that I would rewrite rongrong’s text, leaving occasional fragments verbatim.